I'm ready for the new Star Wars ride at Disneyland Park coming soon in a few month. I heard the Star Wars Galaxy Edge ride will be phenomenal with the state of the art effects and plenty of excitement that will satisfied everyone in the whole family. Just like that... so are about 200,000 people expected to come to the amusement park and wanting to get on that ride. Just like that a reservation system is on hand as you might need to be on a waiting list of over 10 hours just to get in line for that ride. Fear not folks, I got plenty of practice waiting in line this year. Good ol' Howlin' Ray's provides plenty of training for that long wait. 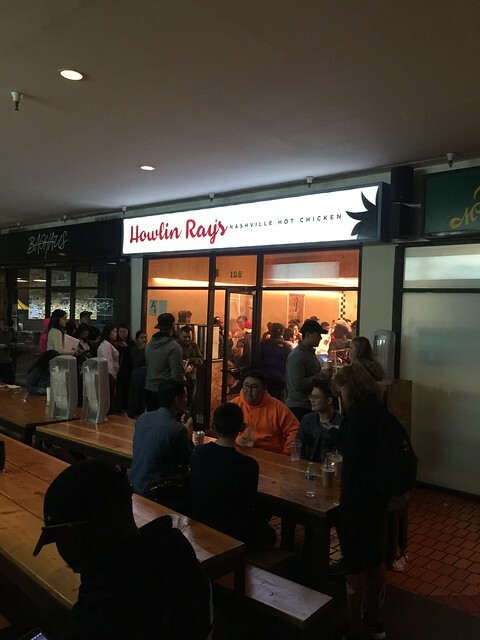 If you have not have heard of Howlin' Ray's, then you probably didn't have a pulse with LA food scenes or just hidden under the rock the past 3 years. 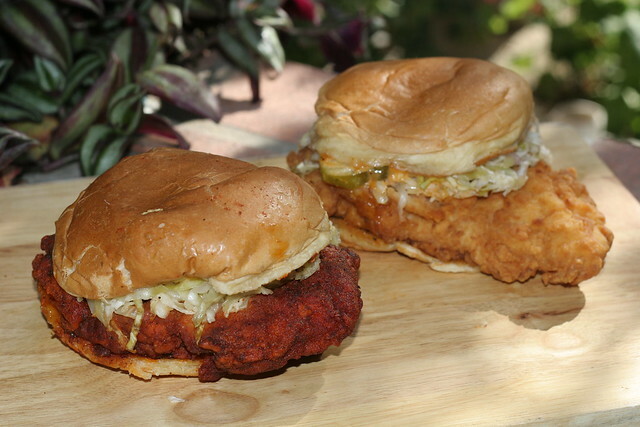 Don't worry, you'll have plenty of time to catch up once you see the line to buy one of their famous Nashville hot chicken. I had the pleasure of meeting Mr. Johnny Ray Zone when he first opened up his brick and mortar front after his sting of sling his chicken at his food truck. Funny part of the story was that he opened up this front in a plaza at Chinatown that was more known for souvenirs and imported Chinese goods. In the front of that Far East Plaza was abundance of Chinese BBQ takeouts and other Cantonese restaurants. Time have changed obviously as there are more hip openings from a coffee shop (MIA), ice cream stand, a bao place from an east coast transplant, hip Taiwanese joint catered to the westerners, and an upscale version of Filipino restaurant all have opened up around the same time as Howlin' Ray's. 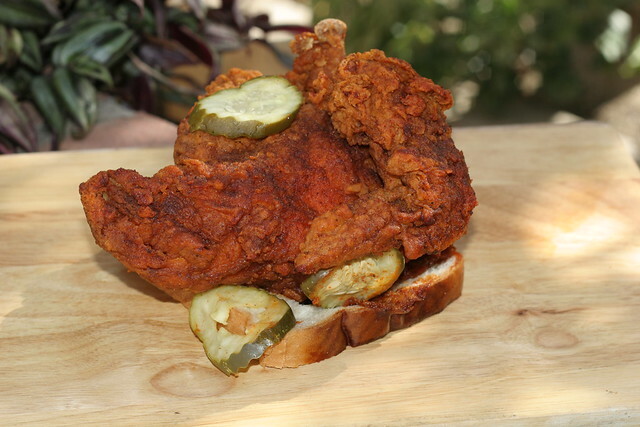 After seeing the restaurant gain popularity from local media and social media presence, the place blew up with long lines from young and old seeking this Nashville Hot chicken people have often heard, but never able to experience it unless you travel farther east. Surprised no one ever caught on to that as there are many options of different fried chickens in southern California, but never this variety. 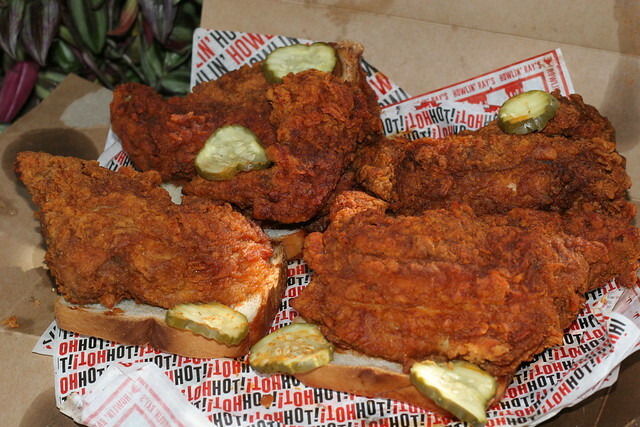 Nowadays, you can't turned around without some announcements of a new Nashville style hot chicken being offered up. What makes this place that popular for a long line? I guess it all starts with the chicken. There six different spice levels you can choose. I often settled between Mild (#2 on the hot scale) or Medium (a step up from Mild). You can go on a dare and try their Howlin', which was taste numbing, sweat inducing, and nosebleed crotch of a hot heat. The smell of this heat can already make your eyes watery. Just by touching it will already leave that smell on your hand for hours. The nosebleed is not exaggeration for some of us as we are never able to muster through the whole breast or leg without feeling sniffle and the cries of mercy. Not sure it's pain or tears of joy, as eating Howlin' level can be both at the same time. The thing I admired about the chicken and why I was waiting in line every quarterly was the fact the meat was juicy and the crispy skin was not flaking like a weak butter skin. I hated the water down skin you see from a certain well known chain. The meat was important, but the battered fried skin was one of the few things I enjoyed about Howlin' Ray's version of fried chicken. When I first started coming here, the line was probably less than 20 minutes. Gradually as the words of mouth got out, it expands to 40 somewhat minutes. Then you know it got serious when it is over a hour. Then for some eff'd up reason, it now gets ridiculous at weeknight for 100 minutes. (I had been told the line can be 4 hours on weekend afternoon at times). For those might be getting discouraged, we heard expansion is coming. When there is more places opened up, dividing up the crowd to various different joints work. It is often a line killer. Remembered the first "Salt & Straw" opened up and there was a wait? With more locations, it destroyed that long wait. We are hoping this would be case as well for another Howlin' Ray's joint. For me, I'm getting the hang of waiting in line and practicing in advance of the new Star Wars ride. Pro tips on waiting in line, get a few friends to wait with you. There is never a dull moment and the excitement can be heightened. After waiting more than a hour, I still have favorable impression of the fried chicken. Now as in for that wait for one ride...... let's hope it doesn't take up the whole day for one ride.